Dear users, we from DomaZa are glad to inform You that our first magazine for “Real estate around the world” is already a fact. Our campaign has started from Austria and we are expecting our Russian edition to be ready within a short period of time. Our aim is to represent the leading companies in the real property field with their most attractive offers in front of the general public. 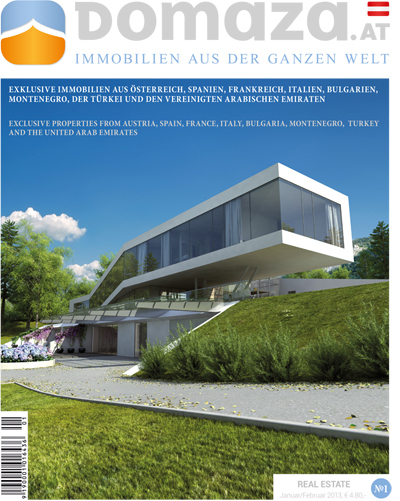 Our first copy is focused on the real estate market in the main European and economic centers such as Austria, Spain, France, Italy, Bulgaria, Montenegro and Turkey and in one of the most taking destinations from the East World – the United Arab Emirates. Because DomaZa is already a familiar and recognized name in international aspect, we have decided to widen our opportunities by transferring the offers from the virtual world on a paper form, which is easily accessible to the end consumers. The individual approach and the aspiration to respond to each client’s needs irrespective of the fact if he is a buyer, a seller, an agent, a constructor or an investor, has helped us to increase significantly the number of our users. With the wide range of offered services along with the option of automatic text translation into more than 10 languages, the DomaZa portal has stepped from the local onto the world scene. Everyone who wants to stay tuned about the contemporary trends in the real estate field can buy the magazine from generally accessible public places. Our catalogue will be exhibited in Russia and the magazine will be distributed at international airports, business centers, gas stations, hypermarkets and through proxy companies. The form and the content are presented in the best possible way in order to be not only useful but also interesting to all the participants on the real estate market – brokers, contractors, owners, consultants, designers and buyers. The advertisers can take advantage of our promotional offers in order to introduce their activity to the readers through different adverts, projects and printed matters. The initiative for creating a written catalogue has the aim to ease at the maximum level the searching and the offering of real estate to the wide audience through information and advertising opportunities. Every two months a new issue of the magazine that includes the most topical and attractive property offers will be published.